Liz Bonnin presents the raucous calling sulphur-crested cockatoo from Australia. Liz Bonnin presents the raucous calling sulphur-crested cockatoo from Australia. It is with somewhat heavy irony that with its loud, jarring calls, the sulphur crested cockatoo is also known as the "Australian Nightingale". These large white parrots with their formidable curved beaks and long yellow crests which they fan out when excited are familiar aviary birds. One of the reasons that they're popular as cage birds is that they can mimic the human voice and can live to a great age. A bird known as Cocky Bennett from Sydney lived until he was a hundred years old, although by the time he died in the early 1900s he was completely bald, and was then stuffed for posterity. In its native forests of Australia and New Guinea, those far-carrying calls are perfect for keeping cockatoo flocks together. They're highly intelligent birds and when they feed, at least one will act as a sentinel ready to sound the alarm in case of danger. 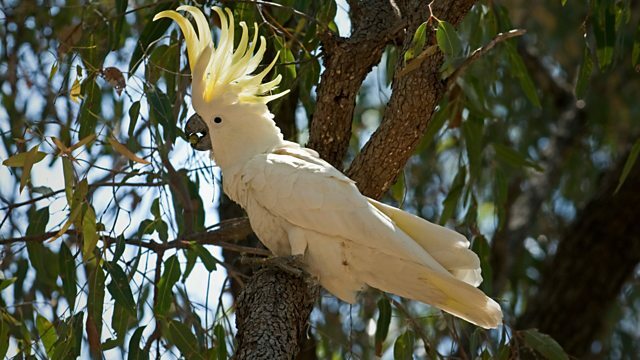 So well-known is this behaviour that in Australia, someone asked to keep a lookout during illegal gambling sessions is sometimes known as a "cockatoo" or "cocky". Webpage image courtesy of David Tipling / naturepl.com. NPL Ref 01429607 © David Tipling / naturepl.com. This programme contains a wildtrack recording of the sulphur-crested cockatoo kindly provided by The Macaulay Library at the Cornell Lab of Ornithology; recorded by Thane K Pratt on 30 Mar 1975; in Bosavi, Southern Highlands, Papua New Guinea.